Annie kept the same room for me. Shannon makes the promises, but Annie keeps the promises. I’ll be here for the next few months at least. I won’t do any camping until the ice is out and I won’t leave for long trips until the flies are gone. That’ll put me to June or July at least. Right now, I’m the only guest at Mowat Lodge that’s not on ‘Doctor’s orders’. Shannon mentioned that he got two guests from Ottawa last week. Tuberculosis patients to recuperate in the fresh air of the North. Each morning they are bundled and put out on the porch. Each evening they are brought back in. For reading I brought a few books with me but Shannon gets the daily papers from the station. They’re a day behind. I reckon that getting the news a day behind isn’t a big deal. I’ll have a lot of time and it’s something to read while I’m down by the fireplace in the lodge. No reception at Mowat Lodge. I didn’t expect any. I’m sure Annie was fast asleep. If Old Mrs. Fraser was awake, she wouldn’t hear anything. She’s nearly deaf and has a tendency to drift off, unannounced, into another world. Mildred, Shannon and Annie’s daughter would be fast asleep too. Quietly, I brought the rest of my gear up to my room. I’ve had the same room for the past couple of years now. It’s on the second floor on the northeast side. My window is the 2nd last from the end. The bed is one of those old metal hospital beds from when this building was a hospital. Shannon replaced the mattresses, but no matter what, you feel like you’re sleeping on a hospital bed. I don’t mind. I often sleep on the ground with just a blanket so I’m used to the lumps and bumps. I would joke with Shannon that when at Mowat Lodge I feel like a resident of a sanatorium. Not far from the truth. I can’t help but be reminded of the painting of Vincent’s Bedroom in Arles. 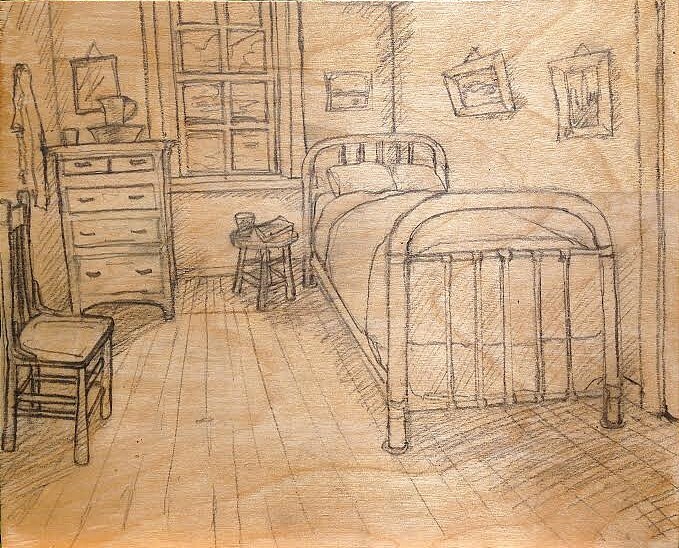 The dimensions of the room in Van Gogh’s painting painting is about the same as mine. The furnishings are similar too. A modest bed, dresser and two chairs. Indeed, the window is in the same place. His window look onto a village street while my window has a grand view eastward looking onto Canoe Lake. I liked what Van Gogh did with the colours and the changes in perspective. Nothing hung straight on the wall and it seems gravity had left for another town. That’s why I liked it so much. He took something so mundane, his room and transformed it into something beautiful. Inspiring. I plan to do a sketch every day until the late spring. That’s when the green colours take over and it is no longer as interesting to paint. If I do one every day, until the end of May, it’ll be about 60 sketches. That’s it for tonight. Tomorrow is another day.